Where were your seats for the first show, Tom? center, nosebleed level, right where the stagelights were pointed at, and next to a little kid who wouldn't shut up. I'd like to add others from people (if that's OK) since I missed seeing other members (like everyone else). Is anyone going to do a Mission Report? I've noticed none of the other bases that have had the concert already has done one yet. Matt, I mentioned in the Yahoo Group I am in the middle of typing one up. Please be patient - somehow I keep getting distracted with a lot of e-mails. LOL! I've had a word document opened for over 24 hours. haha! Oops. Sorry, Kathy. Must've missed that. Here's that mission report. I wrote a book! This was such an amazing event to be a part of! Not only was the concert itself fantastic, the crowds of enthusiastic fans were all such a pleasure to meet and interact with. Not to mention the teamwork between Rebel Legion, 501st and even our local San Francisco Fan Force couldn’t have been better. I’d like to start off by giving a big thanks to Ed DaSilva (Exodus), who is also the XO of the 501st Golden Gate Garrison. 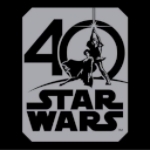 Shortly after the tour was announced, he opened the door for me to communicate with SW in Concert Production staff and Mary Franklin, and I asked if there would be an opportunity for the Rebel Legion be added to the volunteer roster and take part in the event as they had in England. Thanks to Mary Franklin’s endorsement of the Rebel Legion, we were brought on board nation wide for the concert events along with the 501st Legion! 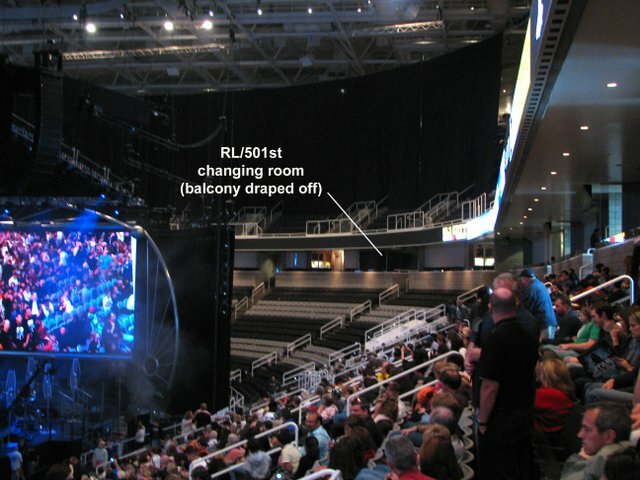 The HP Pavilion in San Jose hosted back to back concerts at 2:00pm and again at 7:00pm. We were instructed to arrive no sooner than 1 hour before doors opened to the public (the production staff was very busy – and wouldn’t be ready for us until that time.). A few of us grabbed a meal to go at a nearby pub, and then met up at HP Pavilion between 11:30 and 11:45. Keirsten (SW in Concert Production Assistant) met up with us and escorted us into the facility, working with HP staff to find a changing room for us. Some time around 12:15 we set up camp in one of the balconies, and curtains were installed to hide us from the view of the public in the arena. Our matinee crew suited up, and then scattered themselves throughout the concourse to meet and greet the concert goers as they entered the building shortly after 12:30pm. Some costume volunteers found backdrops to pose in front of; some positioned themselves in doorway alcoves along the wall so that they wouldn’t block the hallway too badly. Every costume volunteer, from Stormtrooper to Generic Jedi, was surrounded on all sides with families lining up to take photos. All of the young Padawans in attendance were thrilled to have real live Jedi to pose with. Adults and kids were happy to meet Stormtroopers and Biker Scouts. The Biker Scout had a great strategy; he positioned himself right outside our changing room doorway so he could quickly duck in and out for quick breaks without assistance. The Stormtroopers were not too far away from our changing room, but once the crowds entered the facility it was nearly impossible for them to move. 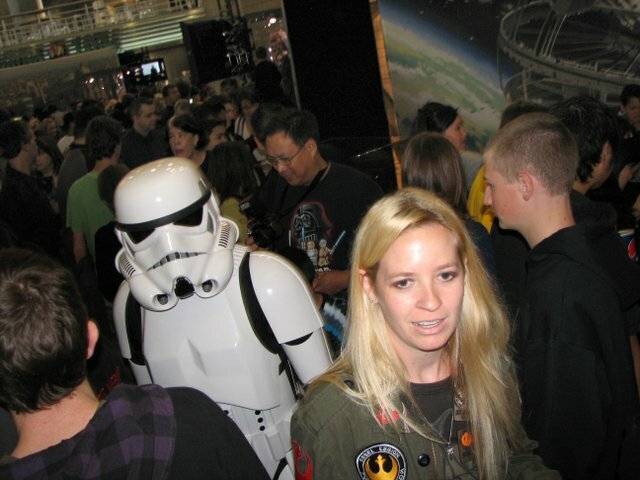 Here we have RL member Jessica (Jeslyn), who signed up as a handler through the 501st, escorting fellow GGG member Brian back to the dressing room. Thank goodness for our handlers! I realize every venue is set up differently, but with the nearly sold out show and narrow sections of the concourse, we had serious bottle necks where people were stopping to look at the costume exhibits or stopping to take photos of costume characters. Moving from one place to another was very slow. And it turned out the non-costumed handlers really saved the day as they could at least move around without being stopped and help round members up, hand out the complimentary concet tickets, or help lead costume characters out of a crowd if they were getting tired and needed a break. 501st and Rebel Legion members owe Jessica a huge thanks for stepping up to help out as a handler, and keeping her Juno costume packed away in the changing room. It’s also very challenging to see any of the exhibit displays once the public is let into the venue. I even ran into a LFL archives employee who couldn’t believe she couldn’t make it over to Vader to check out the display! If anyone is seriously interested in looking at the displays and has an opportunity to volunteer through the Rebel Legion, I strongly suggest you either 1) attend two shows if there are two in your area. Sit one show out and look at the exhibits when people are seated for the concert. 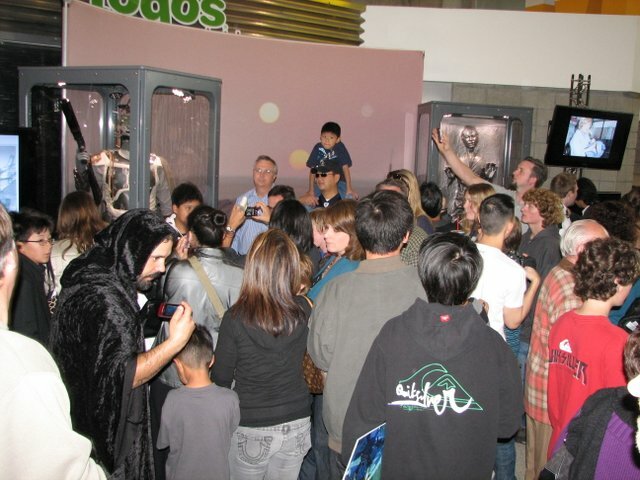 2) If you can come fully dressed in costume, you can use the 45 minutes or so when members are changing into costume to wander the concourse and look at the exhibit before the doors open to the public. So what about the merchandise? There was so much great schwag; it made it very difficult to choose just a few items. There are zip up hoodies, several t-shirts with tour dates on the back, and several women’s T-shirts. My personal favorites were the Women’s Leia T-shirt (holding a flute instead of a blaster) and the gray & pink Leia hoodie! 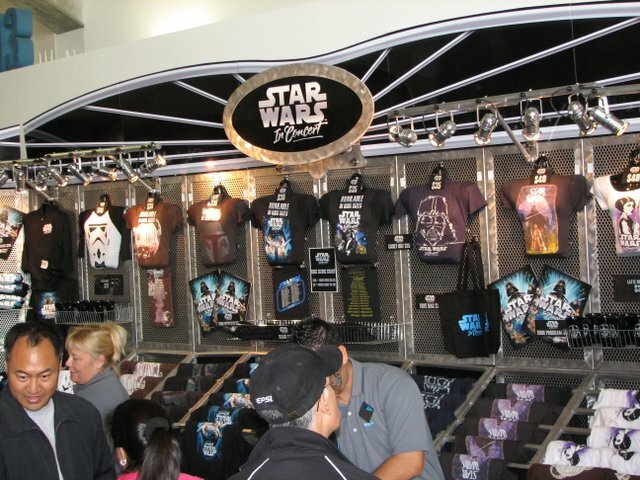 There were lenticular posters, huge color programs printed on heavy stock paper, Vader coffee mugs, tote bags… and the items to sell out the fastest were the caps. They sold out before the end of the first show (boy were the Tolosa’s bummed). I suggest if someone is a costume volunteer, you could line up at the booth just before doors open to the public so you can beat the crowd and be first in line to quickly make a purchase (they won’t sell you anything before doors open, we tried). You can then run it back to your changing room and use the remainder of the time to entertain the crowds. There is also a long enough intermission to run and purchase items during the intermission. You could wait until after the show is over, but you do risk having items sold out by then (unless all you want is a program, there are plenty of those). Our volunteers for HP Pavilion got lucky and were given some great seats to watch the show just behind the sound board, center of the arena. The SW in Concert production staff was also very accommodating to our costumers. The said that as long as we removed helmets and could remain seated for the duration of the show (there are two 45 minute segments) we did not have to worry about taking time to change out of costume before the show. Thank goodness! This made our lives so much easier. The concert itself was fantastic. There are some pyrotechnic surprises that leave the audience members in the first few rows feeling pretty toasty! Hearing a live symphony perform along with a montage of memorable Star Wars scenes was truly a great experience. Having Anthony Daniels narrate the story of Star Wars was like icing on the cake. No Resting – time to prep for the 7:00 show! 6) Crazy Old Wizard (Barry) - ANH Obi-Wan "Ben"
Great report Kathy and what a turnout! Sorry I'm late with my pictures, but between the power outage due to the storm and work, this is the first chance I've had to go through them and get them uploaded. Here they are: Taeriel's RL pictures. I have more pictures from SFFF and the exhibit that I'll get done later. To echo what Kathy and others have said: people really did appreciate seeing us at the event. As I was leaving the 7pm show, I saw one of the families who had taken pictures with us earlier. Their son, probably around 5-6yrs old and in a Jedi costume, asked to see my lightsaber again and was just thrilled by the whole thing. His mother wanted to thank us for volunteering at the event, saying that the costumed characters really made it an amazing experience for the children. Thanks for the photos and the story Alison! 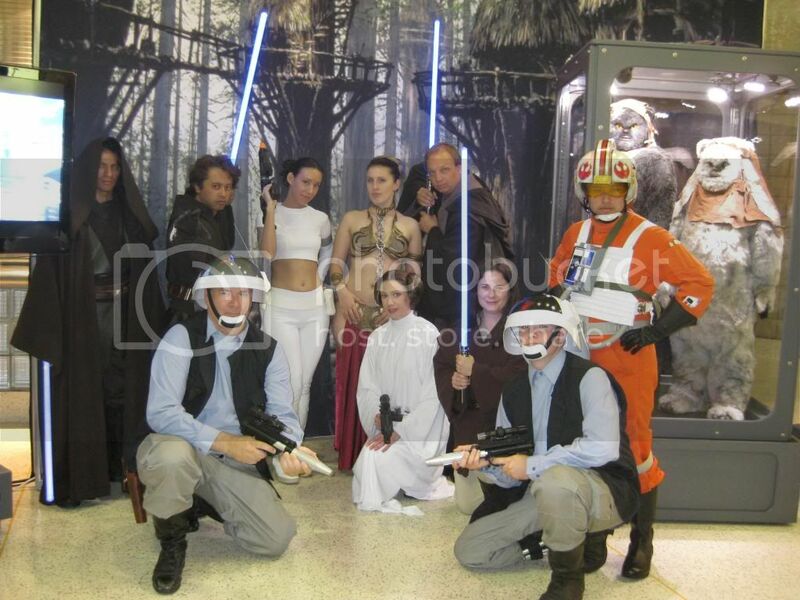 We were told by Betsy they will be making a donation to charity on behalf of the Golden Gate Garrison and Endor Base. (Either Make-A-Wish or Foster a Dream). We'll post an update when we get confirmation. 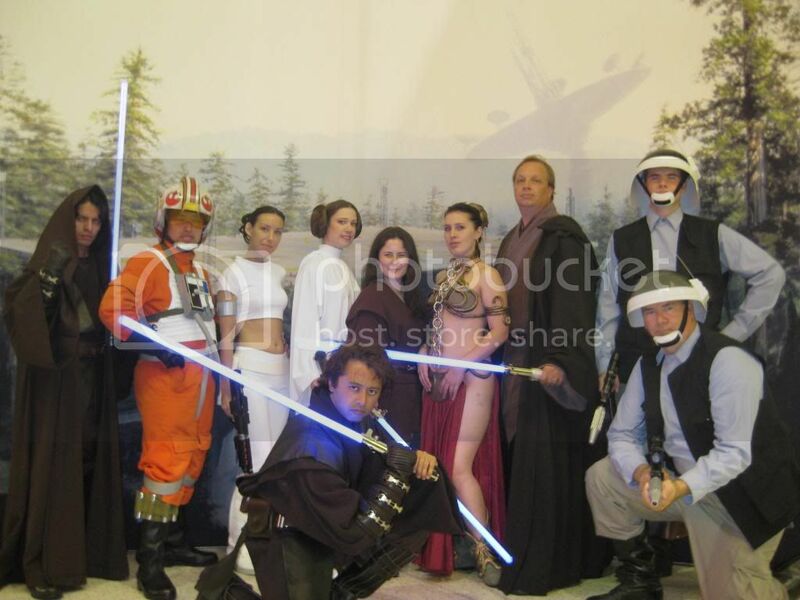 I sent Mary Franklin the Endor Base group photos (the originals, not a link).